Every immigrant absorbs a new cultural matrix, some of which is predictable, some that surprises. When I moved to New Zealand, I thought I knew my adopted matrix pretty well: after all, I had read Erewhon, owned at least three Crowded House CDs, and admired the cinematic settings of Middle-earth. My aversion to Robbie Williams was confirmed by his moko-style tattoos. More seriously, I had been impressed by New Zealand’s record on women’s suffrage and its stance on the nuclear debate. But I was in for some surprises too. I was surprised by the continued cultural significance of the First World War. Every town, every suburb, seems to have a monument to those who fought in the Great War. Some are grand and memorable; many are easy to ignore. Most locals that I spoke to didn’t think much of it, but I often discussed the phenomenon with other recent immigrants. Sometimes it takes an outsider’s eyes to notice a nation’s defining traits. These monuments are the focus of a new exhibition by one of New Zealand’s leading photographers, Laurence Aberhart. 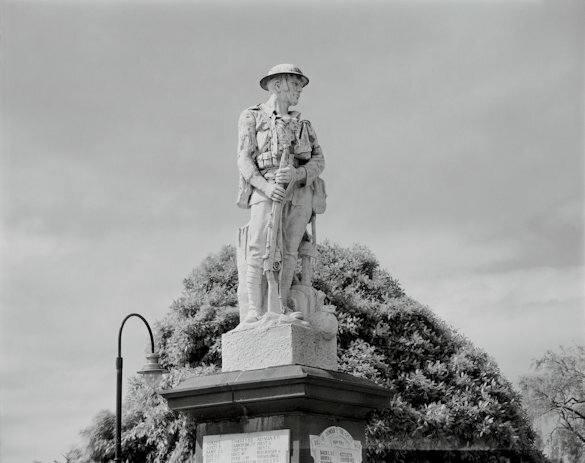 For several decades, Aberhart has photographed memorials to the Great War in cities and towns across New Zealand and Australia. His exhibition “Anzac” opened recently at the Dunedin Public Art Gallery and will travel across New Zealand as we approach the centenary of the landing of the Australian and New Zealand Army Corps (ANZAC) forces on the Gallipoli peninsula. silver gelatin, selenium toned photograph. Australians and New Zealanders think about the Gallipoli campaign with a passion similar to the way Americans think of the attack on Pearl Harbor or the D-Day landings—perhaps more so, since Gallipoli is one of a small handful of military campaigns that have captured the imagination of the greater populace (and thankfully, New Zealanders have few recent campaigns to add to their cultural memory). On 25 April 1915, Australian and New Zealand forces landed on the Gallipoli peninsula south of Istanbul and attempted to storm the high cliffs above. The campaign was intended to remove Turkey, an ally of Germany, from the war, and to defend the Suez Canal. The bravery of these soldiers was immediately promulgated at home, but the campaign was a failure—the heights were never taken from the Turkish forces—and after eight costly months, and the deaths of unrecovered thousands, the Anzac forces withdrew. The troops went on to distinguished service on the European continent and Egypt, but it is this first campaign that continues to occupy the national consciousness. 25 April is Anzac Day, a national holiday in New Zealand and Australia, and Gallipoli has become a place of pilgrimage for Australasians. Patriotic feelings will reach its zenith in 2015, the centenary of the landing. Thousands will attend ceremonies, and millions will watch from home. For a relative newcomer like myself, the idea that Australian and New Zealand identities were forged on the shores of Turkey, in a war involving a continent from which these nations were actively separating themselves, still seems strange. I also find it curious that Gallipoli has increasingly become a site of pilgrimage, not least for those who are too young to have grandparents (or great-grandparents) who fought there. But occasionally the desire to understand oneself and one’s nation takes unexpected detours. This military tragedy has created long-lasting links between the three countries, and in 1985 the Turkish government renamed the bay at Gallipoli Anzac Cove. One hopes the visitors leave with a better sense of their past, and perhaps a greater respect for both the Anzac and the Turkish forces. On the virtual pages of The Migrationist, we rarely think of soldiers or military forces as migrants. But I’d like to suggest we do so. Young people, mostly men, travelling with acquaintances and strangers from their own country to another land, with a mixture of pride and fear. Doing something courageous with their lives to support their families or win glory for themselves. Some will return home, altered by their years abroad and altering the societies they have touched; others will never return. Descendants and survivors commemorate their actions in quiet ways (old letters, photo albums) and grand (speeches and monuments). These characteristics describe both the immigrant and the soldier. silver gelatin, gold & selenium toned photograph. 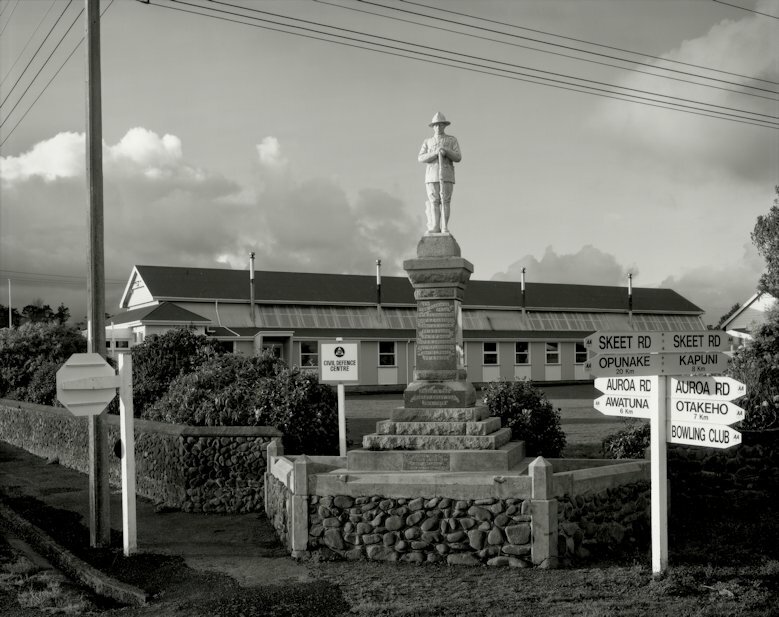 In New Zealand and Australia, memorials to these military migrants typically feature a single soldier standing atop a plinth that records the names of locals who served in the First World War. While some of these statues remain centres of remembrance, many are overlooked or abandoned. Walking through Laurence Aberhart’s exhibition, I was struck by the contradictions his photographs capture. The same stone soldier appears in most of these photographs, but each image tells a different story: about the monument’s and the town’s fate. Aberhart’s success here is rather remarkable: his images retain both distance and respect, without overpowering irony or excessive patriotism. Aberhart’s images of these monuments aren’t timeless; rather they unsettle our sense of time. Part of this comes from his use of black and white—a medium that, like the monuments, recalls an earlier era but remains surprisingly powerful today. But equally important is his inclusion of other elements near the monuments. You’d expect the nearby signs or buildings to clarify the moment of either the monument or the image; but I was surprised how often I misjudged the date by two or three decades. The monument’s moment is set off kilter by the presence of a 1940s era telephone pole or a 1960s era building. Figures and cars occasionally appear, but even their appearance is often hard to date. Rather than capture a single moment, his images become a storehouse of the twentieth century. Trees feature prominently in these photographs; often they compete with the sculptured soldier for the viewers’ attention. The juxtaposition brings to mind the tree that Christ was nailed to (these are monuments to sacrifice, after all), and sometimes the symbolism is made manifest in the crosses formed by flag posts around the monument, or in the ornate tombs occasionally seen in the background. Sometimes the stone soldier disappears into a tree behind, a tree that has obviously grown in the decades since the monument was raised (these oversized trees are often the most evident markers of time in Aberhart’s images). But there is also the jarring sense of incongruence and dislocation—these men fought and died in a foreign landscape where such trees do not grow. The sombre quality of Aberhart’s images fend off the patriotic impulse; but so too does the event these monuments memorialise. These soldiers died far from home, for another country; in the case of Gallipoli, dying in the most appalling and unnecessary circumstances. How many nations build their national identities around tragedy? Imagine the monument to Pearl Harbor without Iwo Jima. Admittedly, neither the photographs nor the original monuments overtly invoke the migratory nature of the experience: that they (Māori and Pākehā) fought and died in foreign lands, among other military migrants (British, Irish, Indian). And yet, as I wandered the gallery, I found “Drummer Hodge” echoing in my brain, Thomas Hardy’s elegy to a fallen British soldier in the Boer War, buried under South African skies, where “strange-eyed constellations reign / His stars eternally.” The lines resonated in three senses, all enhanced by Aberhart’s images. I thought of the fallen soldiers, who will spend their eternity in unhomely surroundings; I thought of those who returned, for whom, after war, New Zealand or Australia would never be quite the same place again; and I thought of the stone soldier, who seems increasingly out of place as the landscape around him changes. Art forces us to see the everyday in new ways. By confronting the impact of displacement and time, Aberhart’s images force us to think about those who fought far from home and those left to remember. They are also meaningful because they record another kind of migration: the movements of peoples within New Zealand and Australia. Monuments that were once the centres of thriving communities in Central Otago now stand solitary: the work has gone, the community has disappeared; but the soldier remains, an intended monument to the fallen, now an unintended monument to a town and a way of life. These images are monuments to many moments, not least our own. A thought-provoking piece Tom. I guess the number of monuments reflects the scale of loss: one in ten New Zealanders served overseas in WWI and over half those who went were wounded or killed. With this loss of sons, fathers, husbands, brothers, uncles, lovers, friends and neighbours one national monument—or even a dozen monuments— in a country that’s 1600km long wouldn’t do the job of helping communities to acknowledge and try to make sense of this loss. Yet, despite the impact at the time, in my childhood in New Zealand Anzac Day received little attention from many, apart from being a public holiday. It has grown in popularity in the last couple of decades. Anti-war sentiments expressed in the anti-Vietnam-war protests subsided and Anzac celebrations grew, perhaps partly because of films about Anzac raising awareness, partly because of a search for national identity apart from fighting Māori in the 1800’s in order to confiscate their land or protestors fighting police and rugby supporters over the Springbok tour, and partly because of being decades removed from the horrors of WWI and WWII. It’s interesting to think of the soldier as a migrant—and in the case of WWI one out of three soldiers were conscripted, so for many it was forced migration, from which they never returned. Thanks, Andrea, for this detailed and thoughtful response. In fact I don’t know what to add; except that, if I ever return to this topic, I’ll probably incorporate some of your observations, which seem spot on. Do you know Vincent O’Sullivan’s poem about a WWI soldier who made the journey to the Western Front from Orepuke in Southland? The poet imagines him as travelling the furthest possible journey of any soldier to meet his death. ← Why Are Unaccompanied Children Fleeing Central America, and How Can the U.S. and Others Respond?